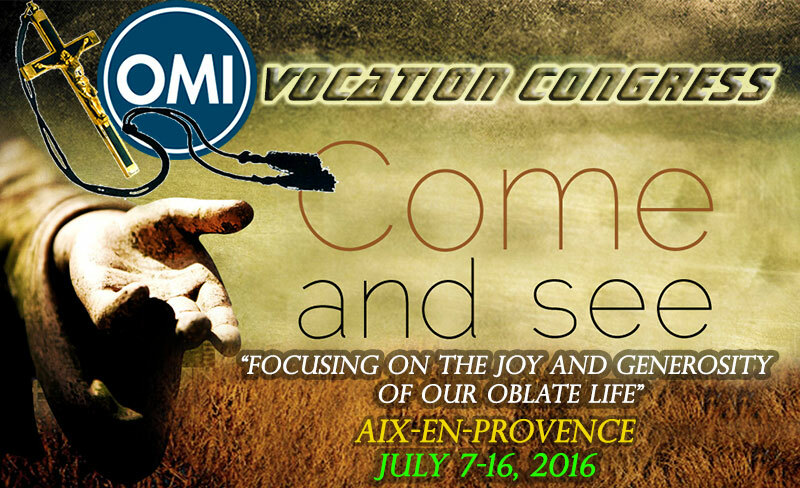 From 7th to 16th of July 2016, about 40 oblates involved in vocation animation will gather with the Superior General in Aix-en-Provence for a Vocation Congress, as one of the events to mark the 200th anniversary of our Congregation. Jesus never ceases to call people to follow him and to proclaim the Kingdom. Some are drawn to answer that call through the joy and generosity of our lives. We must lose no opportunity to let people see how urgent are the needs of the Church and the world and come to know the way in which our Congregation responds to those needs. We will also pray and have others pray that the Lord send labourers into his harvest. The goal is to fan the flame of our charism and renew ourselves in our Oblate missionary vocation, to renew our commitment to vocations ministry, to continue to invite others to join us in this beautiful vocation of preaching and being good news to the Poor as Missionary Oblates of Mary Immaculate. “We are fired by a charism that is unique and special in the Church, one that makes us very close to the poor, the rejected, the forgotten, the people that society ignores, and the people who don’t feel accepted in church. We show a very human face of Jesus to the world, one full of compassion and solidarity. I would go so far as to say that our charism lies at the heart of the Church and indeed at the heart of the Gospel itself. We would be remiss if we did not enthusiastically and boldly continue to invite young people to live as consecrated religious missionaries, priests and Brothers, within our charism” (Father General, December 2013). i humbly wish to apply for admission into the missionary Oblates of Mary Immaculate. I am John Livinus Okoi by name, a native of Ugep in Yakurr local government area of cross River State of Nigeria. I attended Dr Okoi Arikpo memorial secondary school, Ugep from the year 2012-2017 and sat for the West Africa Senior Secondary school Certificate Examination(WAEC) and obtained eight credits including English language and general mathematics respectively. I am baptized and confirmed Roman Catholic, am a member of St Jude society of Nigeria and also a member of the Legion of Mary in my parish. I will be very grateful, hardworking and obedient if my humble application is treated with sympathy so as to actualize my dreams of becoming a Roman Catholic priest in the Oblates of Mary Immaculate.